The Enormous Crocodile is very greedy and loves eating children! But the other animals plan to ruin his wicked schemes and teach him a lesson. A true genius...Roald Dahl is my hero (David Walliams). Phizz-whizzing new branding for the world's No.1 storyteller - Roald Dahl. The Enormous Crocodile is very greedy and loves eating children! But the other animals plan to ruin his wicked schemes and teach him a lesson. 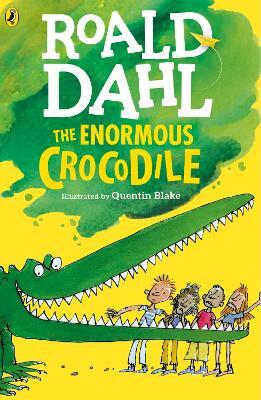 Now you can listen to The Enormous Crocodile and other Roald Dahl audiobooks read by some very famous voices, including Kate Winslet, David Walliams and Steven Fry - plus there are added squelchy sound effects from Pinewood Studios! And look out for new Roald Dahl apps in the App store and Google Play- including the disgusting Twit or Miss! and Hosue Of Twits inspired by the revolting Twits.